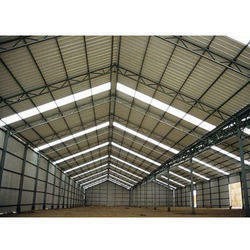 We are a well-known enterprise engaged in developing high in demand Tin Shed. We have gained expertise in fabricating the light weight steel frameworks that are designed and developed with help of advanced software and premium grade raw materials. Designed as per set industry standards, the quality compliant tin sheds are robust and feature remarkable strength. Further, we are leveraging the advanced designing techniques and delivering the lightweight prefabricated tin sheds in customised dimensions at a leading price. Looking for Tin Shed ?